Quick clocking in with just your fingerprint. Advanced level time & attendance solution. GeoTime 200 by Time Systems UK is an advanced level fully featured clocking in machine with time & attendance software. 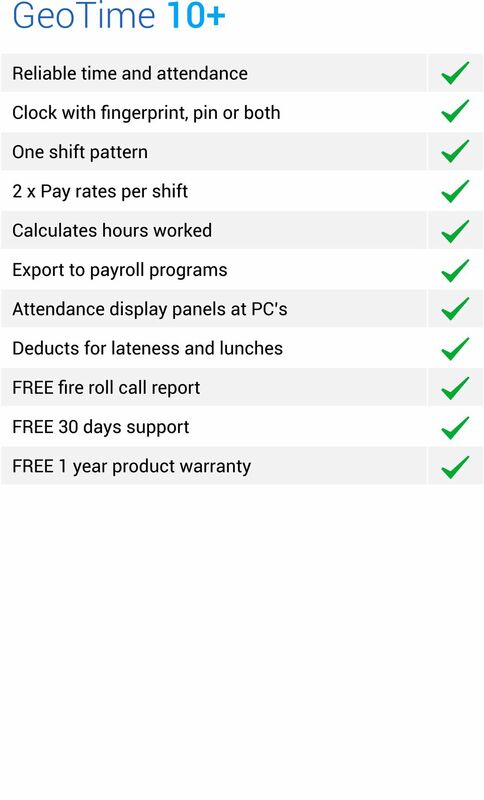 The GeoTime 200 features holiday and sickness calculations, network ready, Fire Roll Call, Sage Payroll Import, additional Payroll Export, Key Personnel Displays. Includes 30 Days Free Software Support + 1 Year Free Hardware Warranty. Each employee presents their finger to the GeoTime clocking in terminal and once recognised this creates an in/out transaction. The terminal displays the result of the attempt along with an audible message. GeoTime 200 can export to almost all known payroll systems. 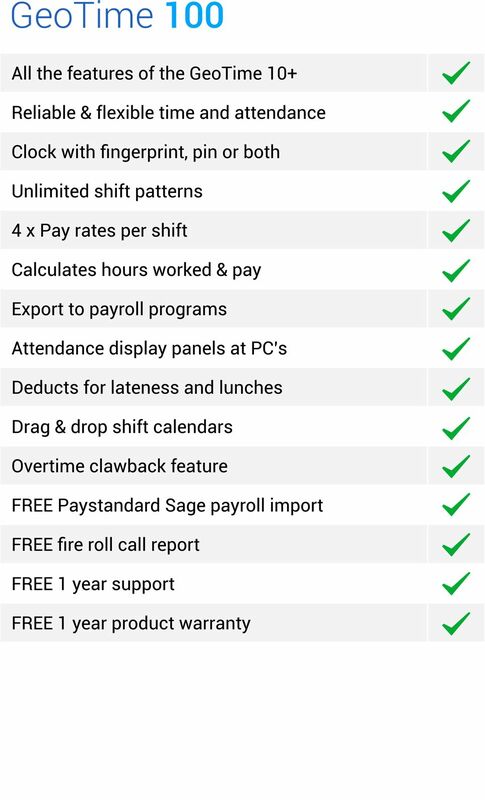 GeoTime 200 comes complete with PayStandard Software - Our Sage Payroll import program. 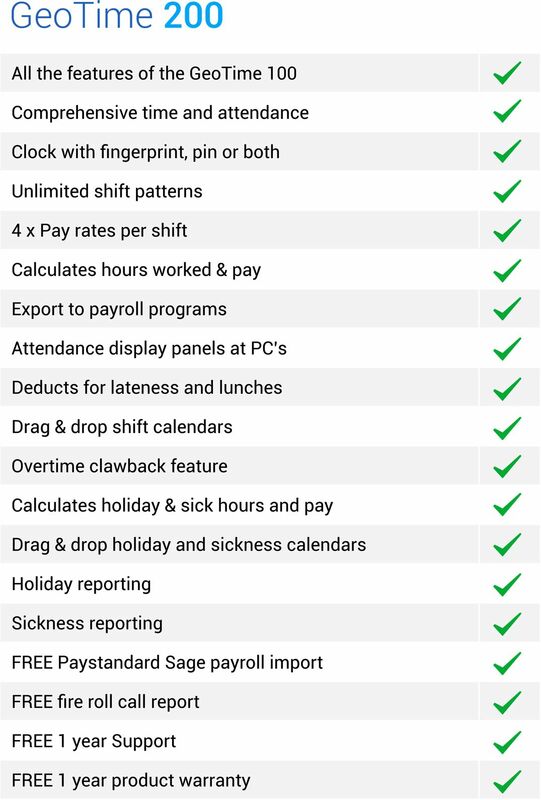 With a PayStandard payroll link these figures can be imported into Sage Payroll, safe, reliably and automatically. You can export your time card and other data from GeoTime 200 for use in other payroll packages or Excel spreadsheets. GeoTime 200 exports all data to a file in CSV format for use in Excel and almost all known payroll systems. GeoTime 200 Automatically calculates the correct figures for payroll.